In a market segment dominated by the compact roof prism binocular, the Opticron HR WP 10x42 re-thinks, re-works, and re-packages the porro prism binocular for today's more demanding user. 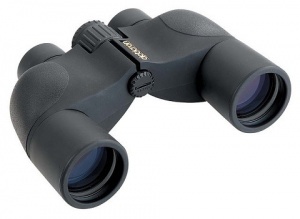 Designed for both the enthusiast and those seeking the very highest optical resolution for their money, the Opticron HR WP 10x42 successfully combines the innate qualities of both traditional porro prism and modern roof prism formats into a single multi-purpose, user friendly, high performance field glass. Each optical system uses the enlarged 'B' porro prism format in combination with internal focusing and long focal length long eyerelief eyepieces. Component glass materials are of a very high quality and all air-to-glass surfaces are fully multi-coated to minimise light loss through the system. To keep weight at a minimum while maintaining rigidity, the chassis is built using a mix of aluminium, magnesium and plastics. Hermetically sealed, each instrument is fully nitrogen waterproof to a depth of 3m and is guaranteed for 30 years against manufacturing defects. The bold and innovative design is finished in a smooth natural rubber covering with a high contact surface pattern for extra grip. The models also feature Opticron house-style focusing wheel covering, twist type retractable eyecups and left side dioptre adjustment situated on the centre focus wheel. For truly high resolution optics in a modern form, look no further than the new HR WP binoculars. Opticron HR WP 10x42 binoculars are supplied complete in soft case with 31025 rainguard, wide nylon lanyard and objective lens caps.